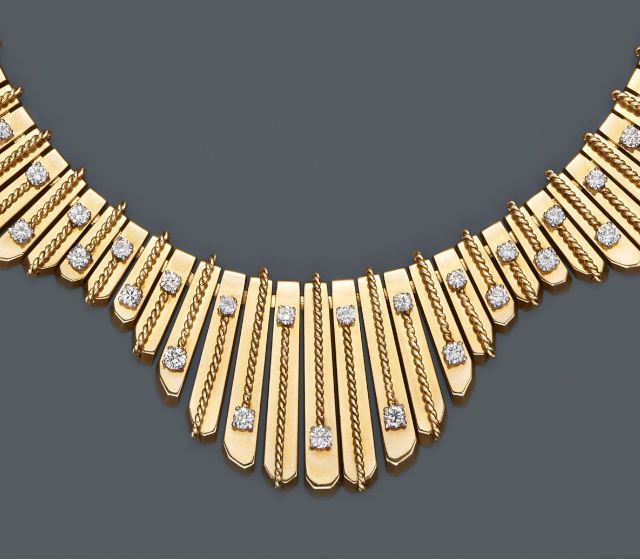 Since 1847, Cartier has epitomized exceptional jewels. The Prince of Wales (Edward VII) described Louis Cartier as “the jeweler of kings, the king among jewelers.” And he certainly was: King Edward VII of England, King Alfonso XII of Spain, Tsar Nicholas II of Russia, the Maharajah of Patiala, the Duke and Duchess of Windsor and Prince Ranier and Princess Grace were all clients. In the early 1900s, even before Art Deco style emerged, Cartier renounced the figurative designs of Art Nouveau for abstract shapes and geometric motifs. The house was also the first in Europe to make jewelry out of platinum. During the Roaring Twenties, Cartier became the ne plus ultra of Art Deco grandeur, with designs that often incorporated Asian and Egyptian themes, inspired by the discovery of Tutankhamen’s tomb in 1922. Botanical and fruit designs took their cue from the Islamic flower motifs of the Mughal Empire, marrying Indian stone carving techniques with French platinum and diamond settings. These joyful, colorful jewels would eventually be known as “Tutti Frutti” and are in high demand today. The Cartier panther, which first appeared on a women’s wristwatch in 1914, became the company’s signature. “The Panther” was also the nickname for Jeanne Toussaint, Cartier’s director of fine jewelry from 1933 to 1970, who was known for her strength and daring sense of style. She would introduce a menagerie of panthers over the years, always lithe and sumptuous, with glinting gemstone eyes. She was also the visionary behind Cartier’s meaningful bird designs, including the caged bird that Cartier introduced in 1942 as a symbol of resistance to the Nazi occupation…and the bird poised for flight that was released in 1944, to represent the end of the war. Two of the world’s most famous diamonds passed through Cartier’s hallowed halls. In 1910, Pierre Cartier, Louis’s grandson, sold the blue Hope Diamond to American socialite Evelyn Walsh McLean and her husband. In 1969, Cartier sold the 69.42-carat pear-shaped stone that would become known as the Taylor-Burton Diamond to Hollywood’s most passionate and scandalous couple. Cartier is also known for the quintessential pieces that define everyday luxury and good taste. The Tank watch was born in 1919, and its clean lines are just as chic a century later. In 1924, the Trinity ring—three interlocking bands in yellow, white and rose gold—became fashionable among Parisian society and remains an essential today. And the Love bracelet, introduced in 1969, continues to mark romance and style among Millennials and matriarchs alike.